Audio recording is disabled by default. For example, the LED light can be customized to always be on or triggered by motion. You can also choose a strobe light setting, in addition to setting a schedule for when the deterrence LED should automate. Lorex 1080P LHA2000 4 Ch 1TB DVR with 4 LAB223B 1080P Cameras 130ft Night Vis. This provides extensive security coverage perfect for doorways, large indoor areas, or backyards. See up to 130ft / 40m away in ambient lighting and up to 90ft / 28m away in total darkness. Each LHA2000 Includes. View live in clear high definition and watch recorded video later with the pre-installed 4TB security-grade 100% duty cycle hard drive, allowing you to digitally zoom in on fine details. Introducing the evolution of High Definition analog security with the advanced Lorex Ultra HD 4K (8MP) solution. These features, plus eight open channels on the NVR, makes this an incredibly versatile security system perfect for any type of property. NVR Features. Easy PoE installation and other custom NVR settings to monitor smarter. Video motion detection. 7” wireless LCD monitor. Manual, motion, and schedule recording. Secure wireless signal (FHSS). Up to 150ft (50m) indoor / 450ft (150m) outdoor wireless range. Listen-in audio monitoring. Compatible with Lorex MPX Series DVRs only. Their range can also be extended up to 800ft (244m) from the DVR using a single run of coaxial cable. Security in 1080p HD resolution. HD MPX DVR Systems. Lorex Secure™ Enabled. NVR Features. Easy PoE installation and other custom NVR settings to monitor smarter. Platform 4K NVR systems 2K NVR systems 1080p HD NVR systems 720p HD NVR systems 1080p HD DVR systems. The next generation of security monitoring is here. Platform 4K NVR systems 2K NVR systems 1080p HD NVR systems 720p HD NVR systems 1080p HD DVR systems. Night Vision Range 130ft (40m) / 90ft (27m). IR night vision range up to 130ft (40m) in ambient lighting and 90ft (27m) in total darkness2. Audio recording is disabled by default. IR night vision range up to 130ft (40m) in ambient lighting and 90ft (27m) in total darkness. For example, the LED light can be customized to always be on or triggered by motion. I opened the box to take pictures. Model: LHV21081TC4B. Part Number: LHV21081TC4B. MPN: LHV21081TC4B. This item is new in opened box. Item will be sold as shown pictured. We hope our service will exceed your expectations! All trademarks belong to their respective owners. No claim is made to the exclusive right to use the trademarks listed, other than the trademarks owned by Lorex Corporation. Product may not be exactly as shown. Remote Viewing Capabilities: Yes - with Lorex Cloud™ app for viewing on PC, Mac, iOS®, & Android™ devices. 8-Channel 4K Ultra HD NVR. NVR: -10° ~ 55°C (14° ~ 131° F). 1× Security-grade 2TB hard drive NVR. Remote Viewing Capabilities: Yes - with Lorex Cloud™ app for viewing on PC, Mac, iOS®, & Android™ devices. Get set up in an instant and stay connected with the free Lorex Cloud™ app. Receive important motion alerts on-the-go and enjoy remote live viewing in HD, review recorded videos, and deter unwanted intruders with the remote-triggered siren. Experience professional grade security with Lorex. Remote Viewing Capabilities: Yes - with Lorex Secure™ app for viewing on PC, Mac, iOS®, & Android™ devices. Resolution: 4MP Super High Definition (HD). Unit in very good condition, fully functional. Includes all accessories in pictures. 4K Ultra High Definition Digital Video Surveillance Recorder. FLIR Cloud™ app with 3-Step setup. HDMI output (HDMI cable included) for simple connection to HD TVs. 24/7 security-grade pre-installed hard drive. Each LNB8973BW Includes IR night vision range up to 250ft (76m) in ambient lighting. Remote zoom & focus, 2.7-12mm motorized varifocal AI lens, 102-39°(H) field of view. Electronic Shutter Range 1/3(4)~1/100000s Lens Type Motorized. Protect what matters most with this powerful Network Video Recorder (NVR). Power-over-Ethernet (PoE) cabling creates a straightforward installation process that doesn't require a professional. Remote connection through our FLIR Cloud™ app will keep you up-to-date of activity around your property straight from your smart phone or tablet. Lorex 4K DV9082 8 Channel DVR with 4 LBV2531 1080P Cameras 130ft Night Vis. Each LBV2531 Includes Available for iOS, Android, Mac and PC, FLIR Cloud lets you view your entire security system from anywhere in the world. DVRs such as this are capable of working 24/7 without a break. DV900 - SEALED. 4K Ultra High Definition Digital Video Surveillance Recorder. FLIR Cloud™ app with 3-Step setup. HDMI output (HDMI cable included) for simple connection to HD TVs. 24/7 security-grade pre-installed hard drive. The LNR6163 includes an hefty 3TB security grade hard drive preinstalled. Keep watch and protect what matters most in greater detail than ever before. It uses Power-over-Ethernet (PoE) cabling for a straightforward installation process that doesn't require a professional. Built-in PoE (power-over-ethernet) ports make installation a breeze. This all-in-one cable provides Compatible with Lorex HD NVR LNR100/LNR400 series only. Compatible with Lorex HD NVR LNR100 / LNR400 / LNR500 Series only. Exclusive LOREX Easy Connect Internet Set-up Wizard. Lorex Pure Flat Lens Eliminates Image Curving. DVR with Pre installed HDD. LED MONITOR. 18.5" Monitor (VGA) with LED back-light technology. Exclusive infrared filter provides accurate color reproduction in all lighting conditions. 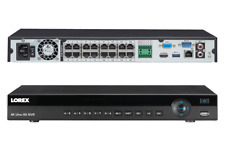 Each DV7163 Includes The MPX168 contains our exclusive 16-channel DV700 HD DVR. Lorex Cloud™ Enabled. Easily consolidate your security system into the palm of your hand with the help of our Lorex Cloud™ app. Lorex FXC33V Specs. Wi-Fi connectivity makes setup and customization easy. Wi-Fi connectivity for remote access via Lorex Secure app for iOS, Android, Mac, and Windows. It features a lens with a wide-angle 155° field of view to view large areas.